An artist's conception of SpaceX's Dragon craft in orbit. WASHINGTON? The private spaceflight companySpace Exploration Technologies (SpaceX) has shifted the planned Nov. 8launchof its Falcon 9 rocket and Dragon cargo vessel to Nov. 18. "SpaceXis targeting November 18th forour next launch with the 19th and 20th as backup dates," said SpaceXspokeswoman Kirstin Brost in an Oct. 23 e-mail. Theflight, a demonstration of SpaceX?smedium-class Falcon9 rocketalong with itscargo-carrying Dragonspace capsulebeing developedunder NASA?s Commercial Orbital Transportation Services (COTS) program,wasoriginally slated to occur in September 2008 per the Hawthorne,Calif. ?based company?s2006 NASA Space Act Agreement. Thefirst COTS demo will be a four-hourflightmeant to show Dragoncan complete as many as four orbits, transmit telemetry, receivecommands,maneuver, re-enter the atmosphere and make a safe water landing forrecovery. SpaceXis one of two U.S. companies with acontract to provide cargo delivery missions to the International SpaceStationusing unmanned commercial spacecraft. Theother company is Virginia-based OrbitalSciences Corp., which is developing the robotic Cygnus spacecraft and anewTaurus 2 rocket to launch it toward the International Space Station.OrbitalSciences won a $1.9 billion contract to provide eight cargo flights tothespace station. Earlierthis year, SpaceX launchedits firstFalcon 9 rocketon in a successful debut flight test. 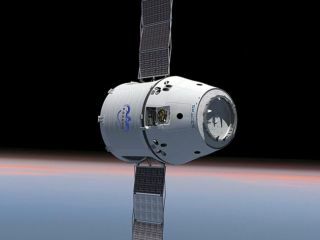 That test flight carried a mockupof theDragon spacecraft which did not separate the booster's upper stage. Thisarticle was provided by SpaceNews,dedicated to covering all aspects of thespace industry/SPACE.comStaff contributed to this report from New York City.